Rebecca “Bucky” Willis says her upbringing in the the Lindale Gardens neighborhood on the city’s northeast side has shaped the way she views her life and her career. That’s why, after earning her master’s degree in architecture from the University of Detroit Mercy (UDM), she chose to stay in her hometown to improve the place where she grew up. “I’ve never moved from the neighborhood because I want to hopefully help dispel the myth that once you reach a certain economic level or some type of educational level that you should move, which is of course a really prevalent myth in Detroit,” Willis says. Willis, 28, promotes social change through human-centered design, architecture, and public art projects with her nonprofit, Bleeding Heart Design (b.h.d). 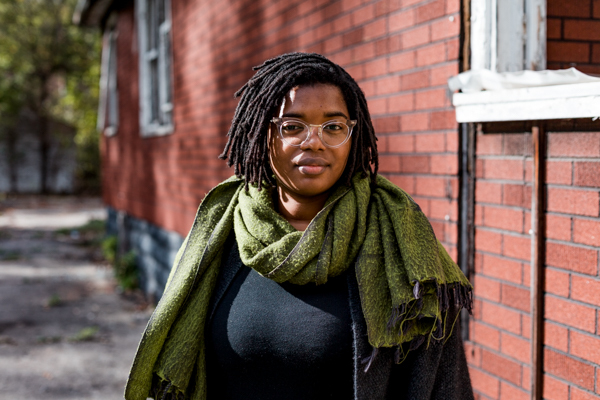 It’s a movement Willis is both passionate and knowledgeable about—her thesis at UDM focused on how architecture and the built environment can influence people to be more caring and loving citizens. Human-centered design is a creative framework for developing solutions to problems through a human perspective. 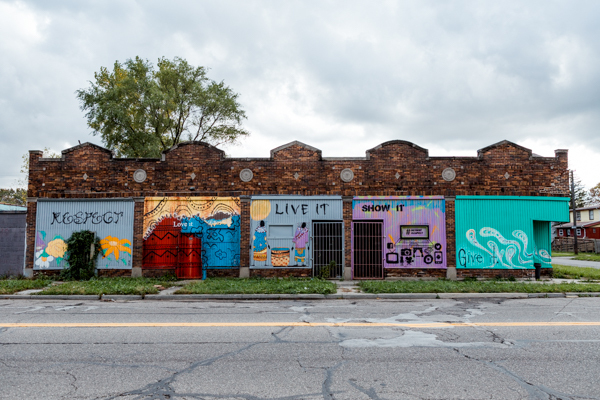 With the help of a $5,000 grant in 2012, Willis launched b.h.d as a project under the Detroit Collaborative Design Center (DCDC), architecture and urban design firm housed at UDM, where she works as a project manager and designer. DCDC continues to partner with b.h.d as a service provider. Over the last several years, b.h.d has created a number of graffiti art installations and opened a temporary community gathering space featuring a mural with the theme of love and forgiveness. Another project involved more than 20 volunteers who painted a house in tropical-bright colors. 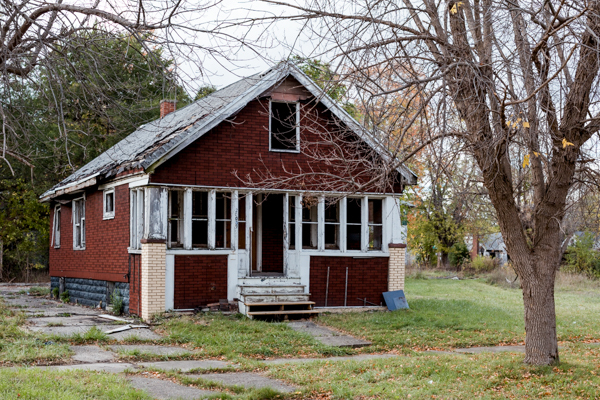 The home, vacant and vandalized, had been set for demolition; the revitalization aims to get Detroiters to think differently about blight and turn it into beauty. Quicker, less expensive projects like murals can make an impact on the community by promoting positivity and self-evaluation, says Willis. She likes to include neighbors in the planning process as well. Once a project is complete, the art helps start conversations, piques people’s interests, and gets them involved in community issues. Since becoming a 501(c)(3) tax-exempt nonprofit, b.h.d has its sights set on even larger projects. It is in the process of obtaining house from the Detroit Land Bank Authority, just one of two remaining on a block that formerly contained about 80, that it will transform into a community space. Willis plans to create the feeling of a courtyard by building a 200-foot-long porch that extends off either side of the 25-foot-wide house. She also hopes to have the home’s interior ready by next summer where residents can host events. Willis wants the extended porch to promote an atmosphere of “urban regal,” a term she uses to explore what it means to be a person of color in urban, Westernized communities and also to celebrate people’s richness and value regardless of how much money they have. “The house will become a representation of what it means to be black or brown and be proud of that,” she says. Bleeding Heart Design received more than $50,000 in funding from Impact Detroit and the Knight Foundation to get the project underway. The money covers design work as well as building the porch and some landscaping. Willis hopes grants, crowdfunding, and sponsorship models will help raise another $50,000 to fund electric, plumbing, and other renovations to the home that are required to obtain the home from the land bank. Once the project is complete, residents will be able to use the space for free, but people who don’t live in the neighborhood may pay a fee as a way to raise revenue. Partnering with the land bank has allowed Willis to bypass some challenges she’s faced in the past with ownership. When trying to beautify an abandoned property, for example, she’s had trouble getting permission from absentee owners. “Most of our issues have been about who actually owns the mess, who actually owns the blight, and then whose responsibility it is to make it look better,” she says. Willis is backed by a seven-member board that includes design, development, and marketing professionals. Board member Diane Van Buren believes it’s important to support intelligent, qualified young people like Willis who are homegrown and dedicated to supporting their communities. While areas like Midtown have received lots of attention, more isolated neighborhoods are just as deserving of redevelopment, and people are needed on the ground to champion the efforts, says Van Buren, president of Zachary & Associates, a finance, development, and planning firm in Midtown Detroit. “While neighborhood cleanups are great, there has to be a stake in the ground and a visual reminder … to help turn the neighborhood around,” she says. It doesn’t have to take a huge investment to transform vacant lots into a vibrant community space. “It can in fact make a huge impact and bring those neighbors together and hopefully bring more people to the neighborhood,” Van Buren says.